Ayurveda, an age-old holistic healing system dating back over 700 years was developed and perfected in Kerala. 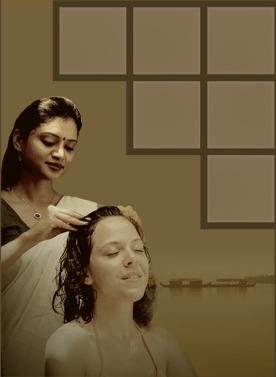 Treat yourself to a nurturing oil massage at our affiliated spa in the salubrious environs of the Ashtamudi Lake. Kollam is the southern gateway to the enchanting backwater network of Kerala, a stone's throw away from the hotel. Climb into the traditional houseboat for a lifetime experience where charm, romance and tranquility are yours for the taking. Let the concierge arrange a package that best suits your requirement. Kollam is the gateway to the famed Ashtamudi Lake; a five minute drive from the hotel. Enjoy a two-hour private backwater cruise on a traditional luxury houseboat. Step right into the enchanting ayurvedic centre lodged on the riverbank. Rejuvenate your mind, body and soul with an ayur-massage of one-hour duration. And what more? You could sip down a healthy fruit drink and some short-eats while you relax under thatched huts among lush green coconut palms. On your return trip, savour some of the exquisite Kerala delicacies, prepared onboard by your personal cook. Includes elephant ride, feeding the elephants, watching the elephants bathe and visit to a nearby conventional coir-weaving unit. Please contact Front desk for the rates.